This debate is one in a long line over the years that have questioned whether or not we should now portray Santa and Jesus as "white," "black," or otherwise. The argument regarding Santa is about inclusivity - whether or not children "feel a part" of the tradition if their skin is a different color than the jolly old man's. The beef over Jesus takes a similar form. People seem to think that a Savior who died for "all" needs to be "all skins to all people" with some sort of divine, Hypercolor outer layer. Can't we just let the truth of history speak? Both Santa and Jesus were real people in the canon of our past. And they both had a nationality, race, religion, and the like. These are straight-up facts. Jesus - the "Word of God made flesh" from John 1:14 - was a Hebrew (read: Jewish) man who grew up in the Middle East. His skin would've been dark and possibly hairy. His eyes would likely have been dark as well. The true, historical Jesus certainly didn't speak English. And He most definitely didn't resemble the blond-haired, blue-eyed, waif-ish heartthrob of a man we saw portrayed in all the Bible movies of the 1940s-'80s. Hel-lo, Isaiah 53:2 (NIV): "He had no beauty or majesty to attract us to Him, nothing in His appearance that we should desire Him." So no, Jesus was not and is not currently...white. Santa is no different. St. Nicholas was a Greek hailing from Turkey! He would've embodied a more Middle Eastern look as well, though the current Santa Claus "image" has all but been taken over by the Dutch Sinterklaas or German Christkind - who were clearly more caucasian in appearance. But Kris Kringle certainly didn't start out that pasty pale. All this is to say, can we not just stick to historical truth? I mean, I get the whole PC culture exists to make everyone feel all warm and toasty inside. And while I agree that we shouldn't make anyone feel "less than"...I'm sorry, but I'm not into changing history to make someone feel more included or accepted. The facts are the facts, people. Can't we just show the true love of Christ to others in order to extend acceptance and care? So why the mini-rant? Well...because we live in a selfish and sinful world. We want things "our way, right away." We get uncomfortable when we can't change circumstances to fit our own desires and preferences. And this is wrong. We are a Judges culture who has forsaken absolute truth for "whatever seems right in our own eyes" (Judges 17:6 and 21:25). And swaying opinions about the skin color of historical figures is only the very tip of that iceberg...which I'm certain our Titanic will crash into on another day, in another rant. For now, feel free to comment below and initiate some discussion. 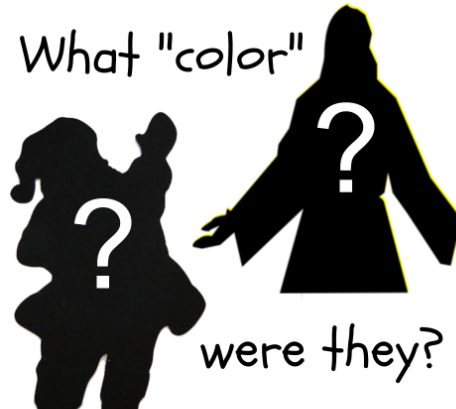 What are your thoughts on the "color" of Jesus and Santa?